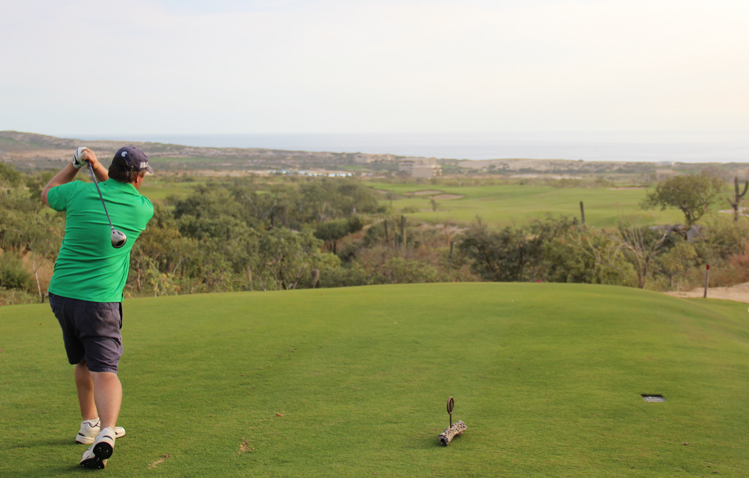 Diamante El Cardonal Hole 1: The golf course starts with a downhill, ocean facing, wide open par five. While there are some bunkers to contend with, this is just about the best scoring opportunity on the golf course. Diamante El Cardonal Hole 2: The green on this slightly downhill par three is unusual in a lot of ways. First, it is huge. Second, it has slopes that are designed to keep most shots on the green. Third, is has a pretty strong right to left slope in most places. 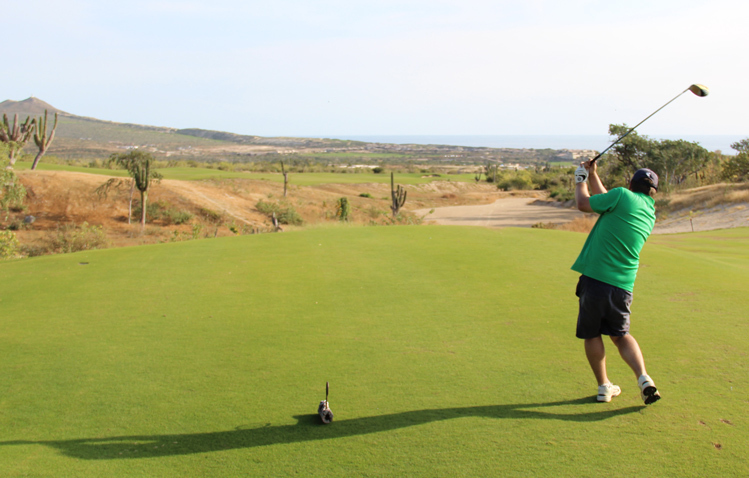 Thus, the player can face some very long and very sweeping putts if the shot doesn't get too close to the pint. The only other real danger is the bunker dead center in front of the green. 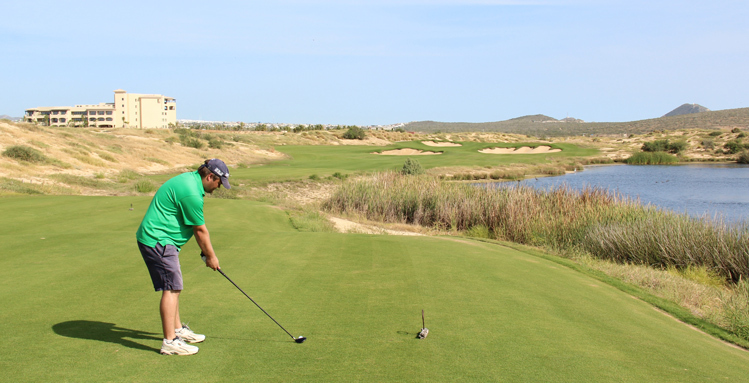 Diamante El Cardonal Hole 3: The day's first par four is short and has water to the right. There are also two large bunkers that the golfer can find from the tee box. However, being such a short hole, only two accurate irons are needed. The green is tiny and has severe slopes that will reject shots that don't find it. 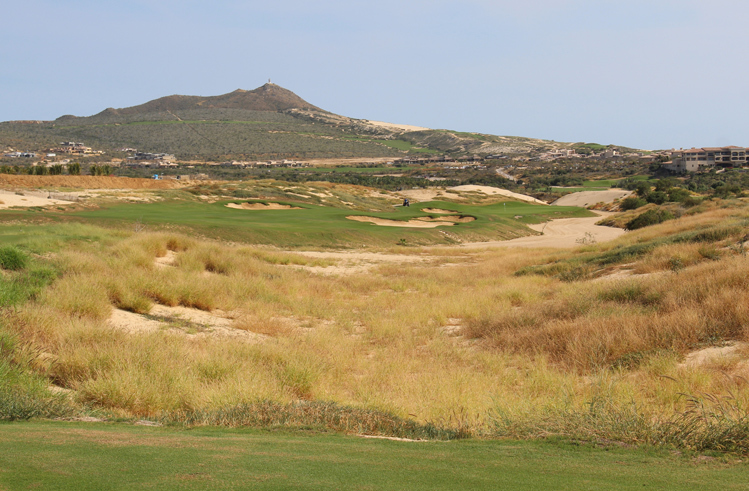 Diamante El Cardonal Hole 5: This downhill par four doglegs right around two bunkers on the right side. Going right of them is trouble in the form of desert. The green is also perched near the desert but has a forgiving slope to its left that may help shots down onto the green that miss slightly to that side. Diamante El Cardonal Hole 7: Yet another downhill hole facing the ocean, this one is a long par four with a big bunker in the fairway that has to be avoided (can be flown by most golfers). From there, the hole is way downhill to a narrow green that is 50 yards deep and has lots of humps and bumps of it on all sides. Diamante El Cardonal Hole 8: The best uphill hole on the front nine is this tough par four. With desert wash all the way down the right side and one of the tighter fairways, the driver must pound a straight drive here. 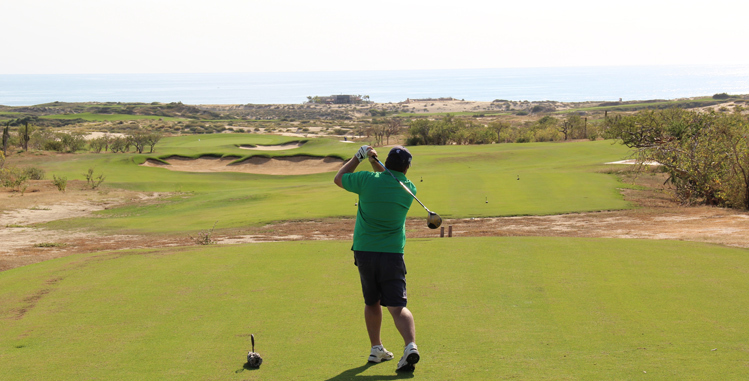 The second is then uphill again, over the desert to a tricky boomerang shaped green with a false front and two bunkers that will gobble up errant shots. 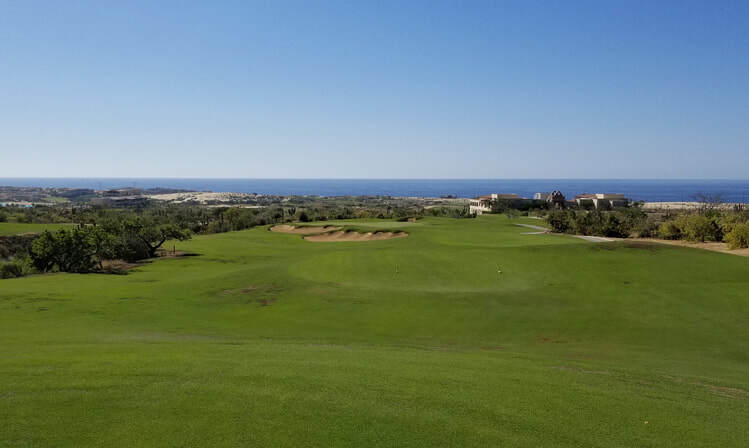 Diamante El Cardonal Hole 9: Like most of the holes on El Cardonal, this one also has an outstanding ocean view; the par three really has one main challenge, and that is to avoid any type of sand short or left. If that can be managed, then a decent shot at par will be manageable. Diamante El Cardonal Hole 11: This downhill par three has a sweeping view; pins cut left of center are very difficult to access behind the massive bunkers. Those center or right are more manageable, but beware that shots tend to run out and will fall into the bunker or swale behind the green quite easily. Diamante El Cardonal Hole 12: Tiger mostly played nice on most of the course, but the 12th is an exception. Uphill all the way, there is desert hazard on both sides of the fairway. The best line off the tee is over the bunker on the left side. The green complex is set way uphill and if anything comes up short or right, it will be rejected back down the slope 20 to 50 yards to leave a nasty chip shot. Diamante El Cardonal Hole 13: This is a solid downhill dogleg right par four. There are no bunkers in the fairway and only one on the hole, which really isn't close to the green. But, there are a lot of natural contours that can leave interesting lies and there is desert that tracks just off the right side the entire hole. 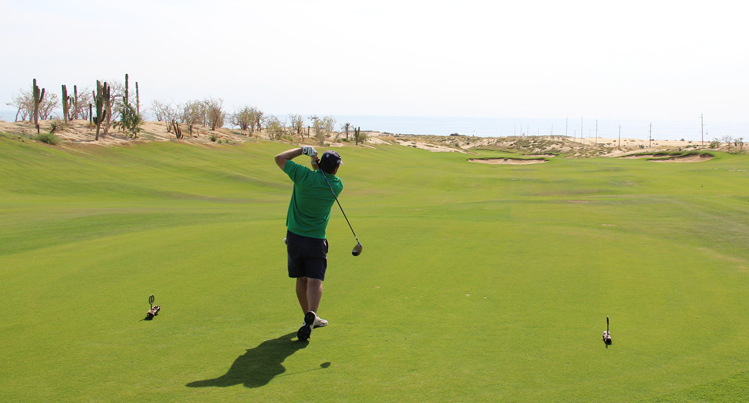 Diamante El Cardonal Hole 14: This par five is uphill all the way and has desert up the left side of the driving area. 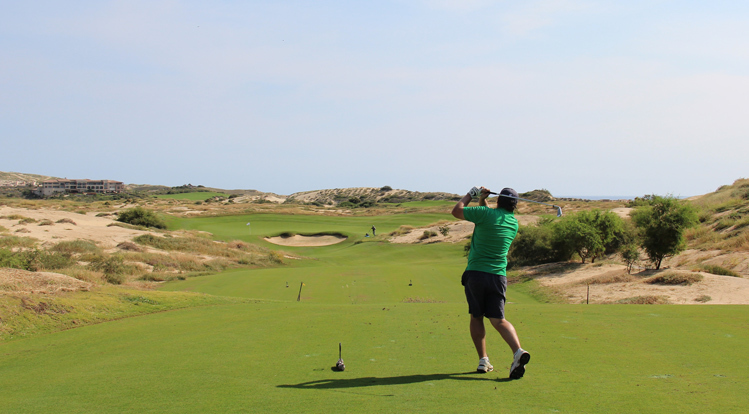 The second shot can either cross back over the desert for a better angle or stay right if the golfer is a little squeamish or hits a bad drive. Diamante El Cardonal Hole 15: The drive here looks a lot more difficult than it is. It's over desert but not a lot of it and the bunkering down the left side looks like there is no room, but there is 50 yards between the bunkers on that side. There is also a good chunk of real estate on the right side too. There is no sand on the approach, just one large El Cardonal and a lot of slopes around the large putting surface. Diamante El Cardonal Hole 16: Short, but uphill and nasty, this par three has hazard fronting the entire green right and left with only the back middle spot over the green providing any bailout. Diamante El Cardonal Hole 17: On a course full of downhill par fours, this one takes the cake. It is large in scale and sweeping, with great views and a lot of obvious trouble to the left. The second shot is a tough one with bunkers to the left and front of the green and hazard left of that. The green also is diagonally running from front right to back left, so a draw is a much better play, if one has that in the bag. More Mexico Golf Course Reviews.